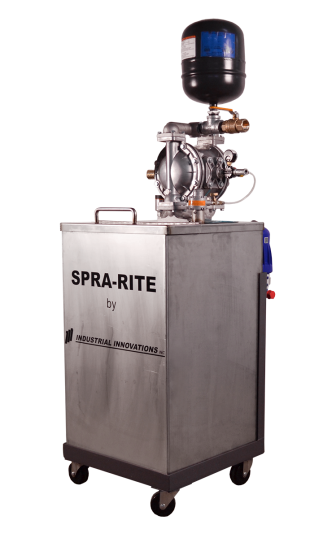 Industrial Innovations, a leading provider of industrial lubrication equipment, has announced the availability of its portable Pro-Mix™ MS proportioning systems. The Pro-mix™ MS provides a mixture of lubricant or coolant concentrate with water on demand at adjustable ratios ranging from 4:1 to 40:1. These systems provide a homogeneous lubricant mixture allowing the metalworking equipment to run more efficiently, with accuracy and repeatability, while improving up time, die life, and part quality. Positioned at the point of use, our Pro-Mix 1 MS eliminates the practice of manual hand mixing and/or transporting pails of mixed lube across the plant floor. The small footprint of only 19-in. wide x 26-in. deep x 62-in. tall, equipped with casters, enables easy placement in your facility to support one or multiple presses (depending upon overall demand) running the same lubricant or coolant dilution ratio. Utilizing a pneumatic paddle wheel agitator, the diluted mixture in the 30-gallon stainless steel reservoir is continuously mixed, which is particularly important with fluids containing solids that may fall out of solution. Sensors detect liquid levels that automatically initiate the mixing system on demand as the mixed lube is distributed to the point of application. Distribution to the press is accomplished using a 37 gallon per minute air diaphragm pump with a pulse dampening accumulator. The stainless steel positive displacement proportioning pump maintains an accurate and repeatable dilution ratio, meanwhile providing long service life. The maximum flow rate of the proportioning pump is 7 gallons per minute. A simple hook up to 120-volt power, plant compressed air, and water gets you up and running quickly and easily.